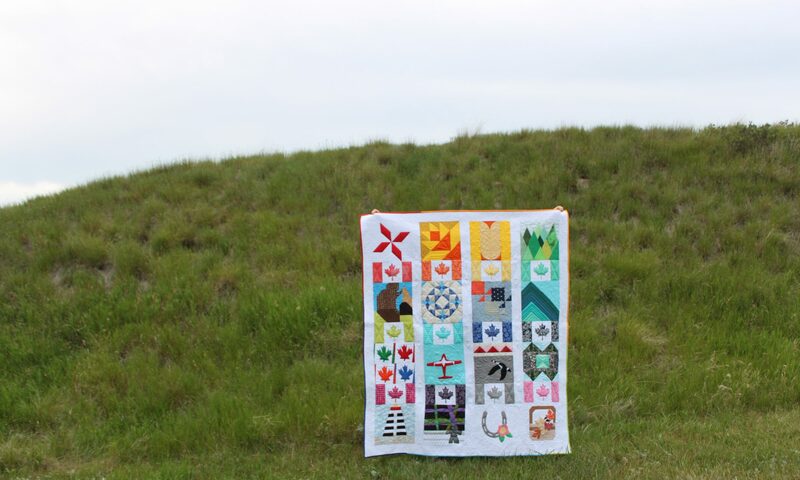 Yesterday at about 5:00 in the afternoon I suddenly got it into my head that I wanted to make a pillow for Canada Day. I quickly designed a project using the Canadian flag block in my EQ7 software. I got started tracing the leaves on fusible web and then had to stop to make supper. After supper I made the flag blocks and then my kids wanted me to watch an hour long show with them. I finished my pillow at about 10:50 p.m. All that to say that you can easily do this project in an evening and it will probably take less than four hours to make. 🙂 This post contains affiliate links. But as you can see… that results in a big block of red in the middle. If making the pillow lay the quilt top on your batting and quilt. If you wish you can back it with muslin before your start quilting. I just left mine with batting only. My pillow top was quilted with wavy lines about an inch apart and then I free motion quilted around the edges of the maple leaves. If you prefer you could zig zag or blanket stitch your edges. The fusible will keep them from fraying too much and we probably won’t be washing these pillows that often. If you do not like free motion quilting you can also straight stitch leaving your needle in at each corner and pivoting the work to change direction until you get all the way around the edges. With fabrics face up overlap these hemmed edges by as much as you would like. (Mine overlap about eight inches which is probably a bit too much as it was difficult to get my pillow form in.) Then lay the quilted pillow top on top face down and pin. Sew around the edges with 1/4″ to 1/2″ seam. Go around twice to be on the safe side. Trim off excess backing, clip corners and turn right side out. Make the pillow form by folding your muslin in half and stitching around the three raw edges with a one inch seam leaving a five inch opening on the long side for turning and stuffing. Clip corners, turn out and press. Then stuff with stuffing to your desired firmness making sure to really get the stuffing into the corners. Hold the opening closed with Wonder Clips and sew it shut with your sewing machine. (It’s tricky, I know… go slow and watch your fingers.) Or if it’s really stuffed and you can’t get it under your needle sew the opening closed with a whip stitch or a ladder stitch. Thank you so much for this tutorial! I am off to find some red fabric. Oh YAY! This is perfectly patriotic. And so pretty! Thanks so much for sharing the pattern, Anita. You are so generous! Beautiful Canada pillow – I am planning to create a table runner from your instructions.